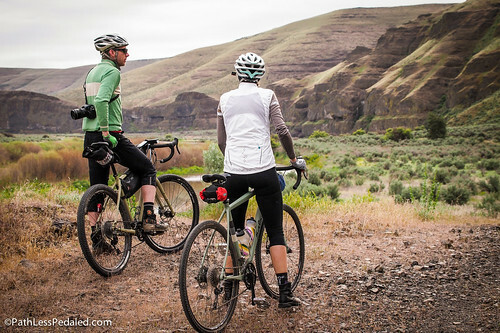 Rode Trip is our series of recommended bike travel ideas. If you have a route or a destination you think we should explore, contact us! 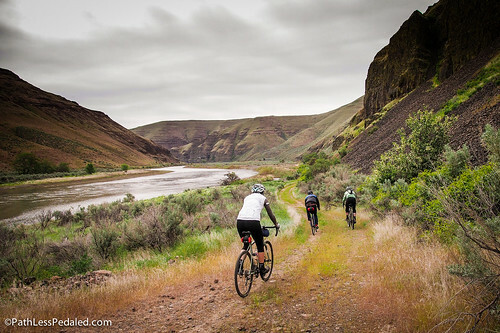 Cottonwood Canyon State Park is located right along the John Day River and is one of Oregon’s newest and largest State Parks. It is about a 2.5 hour drive from Portland through the Gorge, so unfortunately it is a bit challenging to get to purely on bike. However, it if you have access to an automobile, it makes for a beautiful place to basecamp for a few days to ride, hike and fish. 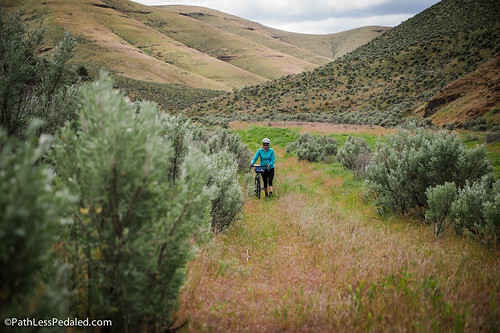 The landscape is full of sagebrush and rocky basalt cliffs which cradle the John Day River. The park has 21 primitive tent campsites with a vault toilet and even 7 dedicated hiker/biker sites. There is potable water available as well as a large gazebo in the day use area which makes for a great place to hide from the mid-day sun. There are also remnants of an old ranch on the property so it gives the feeling of doing a farmstay when you are on the property. We went, of course, interested in the mixed terrain riding possibilities. 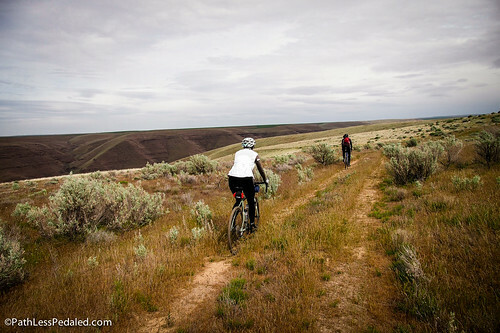 Often we think of State Parks as simply destinations on a bike tour, a place to pitch your tent then move on, but more and more we think they also make great basecamps for loops and deeper exploration (read our Gravel Getaway tour from Stub Stewart State Park). We arrived mid-morning on the first day and after dumping our gear, Laura, our friend Robert and I assembled our bikes and hit the road. We were tipped off to some interesting rides by Dave, the resident park ranger, who suggested we check out a few particular faint squiggles on the map. 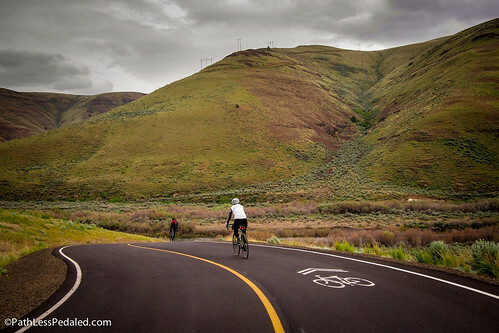 Every ride out of Cottonwood Canyon State Park begins with a climb (but also ends with a screaming descent) since it is at river level. After about four miles and 1000ft of elevation gain we turned on to Starvation Lane (they never name these roads Happy Unicorn Way do they?) which was immediately gravel. From here, the terrain is lumpy but not overly steep and the traffic is pretty non-existent. For the next four miles we rode through a windfarm beneath the giant spinning propeller blades. We didn’t notice it at the time (who does?) but we were getting a nice little push with a tailwind. About to tilt with windmills. After about mile 9, the scenery really opened up. We started to get views of the John Day River and the canyon it has carved out over time. We started slowly losing elevation back towards the river. You can take Starvation Lane all the way down to the river with a screaming descent. We decided that since it was late in the day we would rather explore the ridge a bit more so we hopped on a bit of double track that looked like it would lead to an overlook. The surface was a little sandy but surprisingly rideable on the 35mm tires we had on the Warbirds. We decided to call it a day and backtracked back to the State Park. The little push we had gotten out was now a headwind, but the slog up the hill had turned into a glassy smooth descent. The roads are such that they provide good sight lines and you can descend with very little braking. 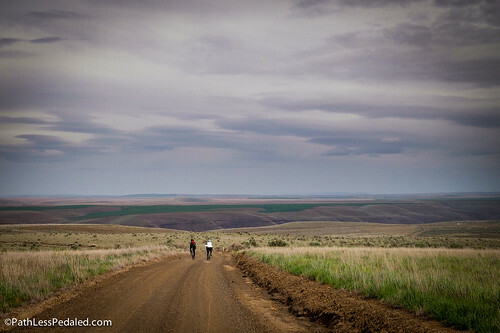 Starvation Lane has some great views as it descends to the John Day. Exploring some unmarked double track. More to explore next time! After we got back to the state park, I decided to take advantage of the remaining daylight and go fishing. This stretch of the John Day holds an interesting variety of fish from steelhead, to smallmouth bass, carp and catfish. This time of year, smallmouth is the fish to target. I recently snapped my 5wt rod so strung up my 7wt switch rod, hoping against the odds and swinging for the fences that I’d get into an errant steelhead. Supposedly someone landed one just last week. Swing and a miss, but couldn’t really complain about the view! Ever the optimist, swinging for steel. Day 2 – #Patchduro – a new kind of riding! On the second day, our friend Adam joined us for more riding. There is a relatively well-maintained trail on the State Park side of the John Day that goes for about 4 miles downstream. On the opposite bank, there is a parallel but less well-maintained but still rideable trail. We took that one. While not as long or aerobically challenging as the ride the day before, the rocky surface kept us on our toes. Adam was riding the new Trek 920 with 29er tires and was doing pretty well. We were a little under-tired for some sections but were able to pick our way across. Parts were a little rocky. The landscape was really something else! After a few bends in the river you get some great rocky canyon walls to one side and river views to the other. The terrain is constantly rolling and the surface is constantly changing. 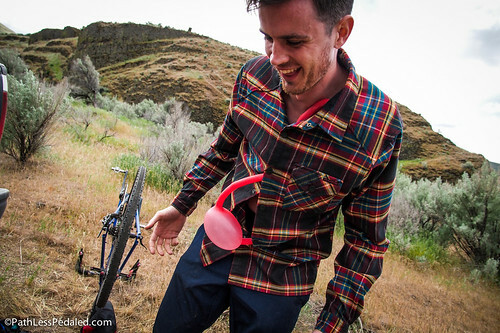 It alternates between hardpacked dirt, to loose chunky gravel, to grass, to babyheads with little rhyme or reason which keeps the ride fun and interesting. 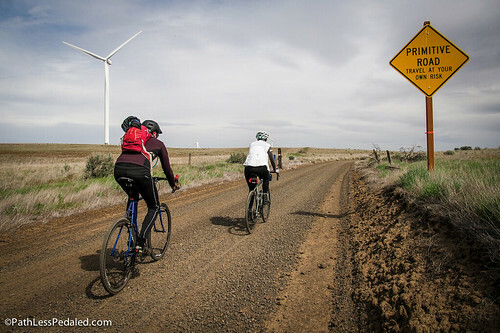 Unless you are on a fat tire bike, you HAVE to pay attention. After about 4 miles we passed through what looked like an old cattle holding pen and left the more established trail for some double track up Hay Canyon. We managed to get up about 2 miles on the double track when we all started to flat simultaneously. A quick look at our tires showed that they were riddled with goatheads. We tried at first to patch them and push on, but it became clear that this was an exercise in futility. My tire alone probably had about a half dozen punctures that were bleeding air. At this point we decided to ride/walk back to the established trail and swap in new tubes there, rather than continue to flat on our last remaining good tubes. Needless to say, it is good advice to either run a tubeless setup with sealant if you plan to go exploring off-trail or bring a large supply of patches and tubes. The mileage of the day wasn’t very high, but the “fun” factor was. When a nice bike ride becomes a long walk. When biking meets The Walking Dead. Because Cottonwood Canyon is a new State Park and is fairly remote, it is a bit of an undiscovered gem. We sort of liken it to smaller Deschutes State Park with far less people. The camping is a little more primitive and you have to pack in all the food you’ll need, but there is potable water. It is a playground if you like to bike, hike, fish and take photos. As with any area in this part of Oregon, there are rattlesnakes and other critters to be aware of, but it shouldn’t deter you from exploring the area (just be aware and prepared). Although we spent two evenings there, we barely scratched the surface in terms of riding. 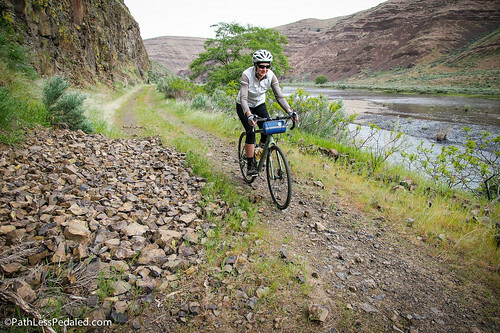 We got tipped off to a pretty cool loop you can do at the right time of year (it includes crossing the John Day but connects two gravel roads) and some fishing advice for future trips. 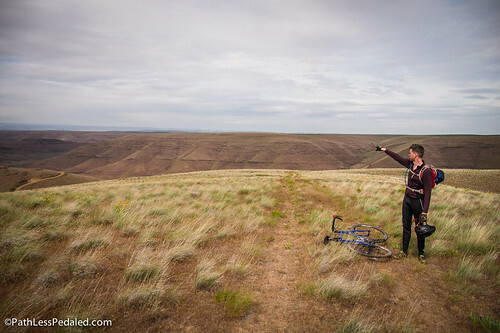 If you live in Portland and are looking for a new State Park to explore, we highly recommend it. There are lots of recreational activities to do out there. For us, we hope to return again in the Fall (after the summer heat cools down and the steelhead fishing heats up) armed with tubeless tires and steelhead flies. Flats are a constant threat if you go off-trail. Be prepared and bring spare tubes, a pump and a patch kit. Or go tubeless (but I’d still bring a spare tube just in case)! Be aware. You are in a remote landscape and there are some natural hazards like rattlesnakes and ticks, so exercise due caution. If you plan on hammock camping, don’t. There are no trees in the camp area. Exploring Starvation Lane and some double track. Partial route of the river trail. Begins at the area where we diverged from the main trail. Total distance of the ride as about 10 miles. we almost spent spring break at cottonwood canyon. thanks for the great write up! i was waiting to make the obvious hammock joke-haha!